Before you go on court make sure your sensor is charged up and take your phone with you. Select live mode from the home screen. The app will try and connect to your sensor. If your sensor is still in standby because you haven't hit any shots yet - that's fine. As soon as you start to play the sensor will wake up and connect to your phone. Choose a specific aspect of your swing that you are interested in monitoring from the drop down menu. Just start to play some shots and the sensor will come on automatically. It will connect to the app if you have selected Live Mode. From here on in this whole session will be counted as a Practice! So if you want to play a match afterwards, you must SYNC your practice session first! The data for the shot will be sent automatically to your phone as soon as the shot has been played. You can monitor your results on the app to get shot-by-shot feedback. Get a partner to feed you if you can, but if you practice solo the app will try and filter out any non-shots such as bounces and pick-ups. Although you get over 10 hours court time from a single charge - do keep you eye on the battery icon to see how well charged your sensor is. Plug into USB to re-charge. See the value presented for each shot you play. You get direct and immediate feedback. You can try adjusting your technique to achieve the values you are looking for. In a future release we will give you targets for each swing parameter depending on the type of shot you are playing. You can also see your minimum, average, and maximum value presented below the main display. If you want to reset these statistics (e.g. if you are starting a new drill/routine or if you are switching from forehand to backhand for example), then just hit the "reset" button. If you swipe left on the big number display you can see a graph if your data too. This is useful if you don't want to look at your data shot-by-shot, but want to play a series of shots and then look back to see how you did. You can hit the "reset" button at any time to reset the statistics and start over. You can also switch to a different swing parameter to examine other aspects of your swing. If you drop out of Live Mode and go to Practices, you will see all your routines listed, along with the results for that routine (the minimum, average, and maximum values you obtained). Go straight back into Live Mode and continue if you like. Even though you can see your data immediately in Practices, your overall stats won't be updated until you sync your data. Note that practice session don't count towards your match play statistics, but are counted on other places (e.g. achievements and challenges). 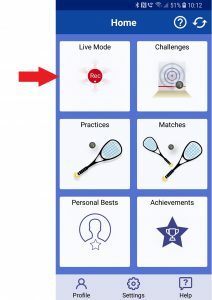 Syncing signifies the end of your practice session and allows you to start a new session (either another practice or a match) if you want to continue playing.